Almanacs, yearly publications containing calendars and usually additional information on holidays, beginnings of the seasons, the phases of the moon, etc., as well as religious articles and secular information of value to the home or farm, have been widely used in Mennonite homes. 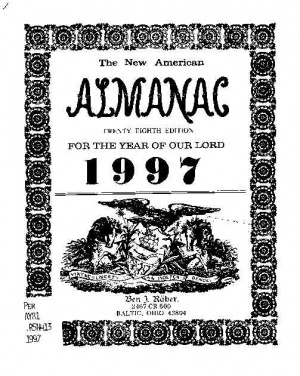 Both denominational and secular almanacs were used extensively by Mennonites, one of the most popular being Baer's Agricultural almanac published at Lancaster, Pennsylvania, since 1825. In 1870 the Mennonite family almanac, later known as the Family almanac, appeared both in English and German (Familien-Kalender), coming from the John F. Funk and Brother press. The Christlicher Familien-Kalender published by David Goerz, Halstead, Kansas, first appeared in 1885 but in 1886 became the Bundesbote-Kalender. The German Christlicher Gemeinde-Kalender first printed in Frankfurt, Germany, appeared in 1892. The Mennonite year book and almanac printed by N. S. Stauffer, Quakertown, Pennsylvania, had its first issue in 1895. The Christlicher Familienkalender für die Deutschen in Russland appeared in 1897. The first Doopsgezind Jaarboekje was published in 1901 for the calendar year 1902. The Mennonite year-book and directory carried the date 1905 on its first issue. The Year book of the Central Conference of Mennonites appeared in 1922. The Mennonite Brethren published their first Vorwärts-Kalender for 1925. The Neue Amerikanische Calender, privately printed and serving an Old Order Amish Mennonite constituency, was first published in 1930 and continued in 2015, along with an English version which began in 1970. Except for the last Amish publication, after the 1950s Mennonites no longer published almanacs that included calendars with signs of the zodiac, moon phases or other information common in popularly-published almanacs. Brigham, Clarence S. An Account of American Almanacs and Their Value for Historical Study. Worcester, Mass., 1925. Gingerich, Melvin. "Almanacs." Global Anabaptist Mennonite Encyclopedia Online. 1956. Web. 19 Apr 2019. http://gameo.org/index.php?title=Almanacs&oldid=132609. Gingerich, Melvin. (1956). Almanacs. Global Anabaptist Mennonite Encyclopedia Online. Retrieved 19 April 2019, from http://gameo.org/index.php?title=Almanacs&oldid=132609. Adapted by permission of Herald Press, Harrisonburg, Virginia, from Mennonite Encyclopedia, Vol. 1, p. 64. All rights reserved. This page was last modified on 11 August 2015, at 17:00.